Andres Iniesta's exit from Barcelona appears imminent, and it will bring an era of dominance, class and genius at Camp Nou to an end. There’s a great anecdote about a young Andres Iniesta, early in his Barcelona days, that is well known among the Barça faithful. It’s also a story that essentially describes the type of player he would become, one who has forever sealed his place in Blaugrana history. Shortly after securing the Nike Premier Cup in 1999 by scoring a late winner in the final, Iniesta, Barcelona’s U-15 captain, was invited to join the first team in training. It was quite the moment for the shy, quiet 15-year-old, who, after joining La Masia four years prior, was quickly getting attention from senior coaches. The invite was a sign of tremendous of honor. There was one small problem, however, as nerves and excitement took over. Iniesta couldn’t find the dressing room. After waiting for his arrival and wondering what could have happened, Luis Enrique, was asked to go and find him. Once he showed up, the first team welcomed a small, frail-looking kid who looked petrified. The club’s captain, a 28-year-old Pep Guardiola, however, saw something else that day. At the advice of his brother, Guardiola had already seen Iniesta play in the competition, and it was he who awarded him the winner’s trophy. Shortly after handing it to him, Guardiola turned to 19-year-old Xavi Hernandez, who was also in attendance, and said, "You're going to retire me. This kid is going to retire us all." That day of training when Iniesta joined, Guardiola made an announcement to his teammates. "Remember this day–the day you first played with Andres." Iniesta’s legacy with Barcelona is one for the history books. The 33-year-old midfielder has won 31 trophies: eight league titles, seven Spanish Super Cups, four Champions Leagues, six Copas del Rey, three European Super Cups and three Club World Cups. With Spain, he's won two European Championship titles and scored a World Cup-clinching goal. When Barcelona is crowned league champion as soon as Sunday, Iniesta will have his ninth La Liga trophy in the span of 13 years. Last Saturday, after Barça’s overwhelming 5-0 Copa del Rey victory against Sevilla, the club’s No. 8 delivered a mesmerizing performance, which included a superb goal thanks to Lionel Messi’s assist. When he came off in the 88th minute, the stadium gave him a standing ovation. Both Sevilla and Barcelona fans stood, clapped and chanted his name for several minutes. Iniesta, sitting on the bench, listened with tears under his eyes. The moment was just too much for a player who has dedicated his career to avoiding much of the spotlight. Andres Iniesta exits the game. Both Sevilla and Barça fans give him a standing ovation chanting "INIESTAAAAAAA." Andres sits on the bench, tears under his eyes. This is why his pending departure from the Catalan club hits home with so many fans, not just Barcelona supporters. Every time we watch him, it’s treated as a soccer lesson, a spectacle and a match rolled in one. On the field, Iniesta controls the midfield with grace, delicacy, vision. His instincts as a distributor, learned from Barça’s pass-and-move philosophy, practically reinvented the way we think of midfielders. After gaining promotion from the youth setup, Iniesta spent two seasons with Barça B, and it was here where he gained experience as a defender. Once joining the first team with Louis Van Gaal, he developed a more attacking role. Versatility and a complete understanding for the game are what have made Iniesta so dangerous. Frank Rijkaard, who managed Barcelona between 2003-2008 and won La Liga and Champions League titles in 2004-2005, took full advantage as he used him as a support striker, a deep midfielder and even a false winger. The opposition, therefore, was given a puzzle, as his counterpart had no idea how to mark him. 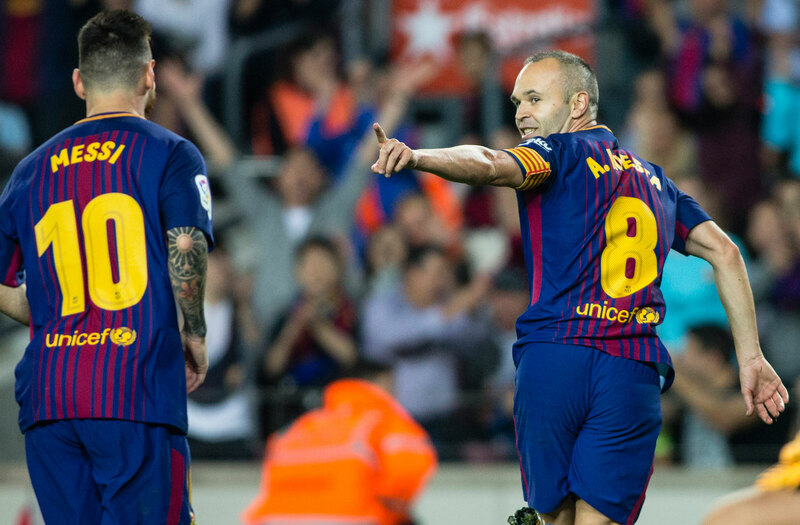 In his book The Artist: Being Iniesta, a four-year project constructed with El Periodico’s Marcos Lopez and El Pais’s Ramon Besa, Guardiola explains how Iniesta taught him how to rethink the role of the central midfielder. When we think about Man City’s recent league success, partly thanks to Raheem Sterling’s development and David Silva’s influence, it’s clear to see what Guardiola meant. When a timid 12-year-old arrived to Barcelona’s La Masia from the small village Fuentealbilla, he wasn’t quite sure if he had made the right decision. He was scared, homesick and struggled with separation from his family. Eventually, the years passed and he overcame his anxieties. Thanks to the only club he’s ever known, the diminutive midfielder leaves Barcelona as a cult hero. It's going to be strange to see wearing anything but Barcelona colors, and some are saying it's too soon for him to leave–especially after what we saw vs. Sevilla, giving a man-of-the-match performance in a final. But an artist should never outstay his welcome or fizzle out in mediocrity. An artist, like Andres Iniesta, should just one day disappear and make us remember the genius he once gave us. Because those memories endure forever, just like his legacy.